Although Dr. King is usually associated with Southern desegregation efforts, he was also supportive of Northern ones, including Milwaukee's violent struggle in 1967. 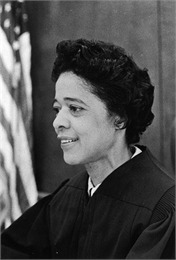 City laws in Milwaukee had supported segregated neighborhoods for decades when Alderperson Vel Phillips introduced open housing legislation in March, 1962. For the next five years, the Common Council voted it down every time she re-introduced it, and black families remained legally confined in a ghetto on the city's north side. When police put down a disturbance there on July 30, 1967, riots broke out that left four people dead and more than 1,500 arrested. Father James Groppi, a white Catholic priest, and the local NAACP decided that Dr. King's nonviolent methods, which had succeeded in Southern cities, could work in Milwaukee, too. On August 27, 1967, they led about 100 demonstrators out of the ghetto into a white neighborhood to protest unfair housing laws. The group was met by a screaming crowd of 5,000 white protesters who hurled racial slurs, rocks and bottles. When Groppi, Phillips and the marchers tried again two nights later, their opponents had swelled to a mob of 13,000 racists screaming, "Kill! Kill! Kill!" As the marchers returned to their headquarters on N. 15th St., they were followed by sniper fire; later that night, the building was burned down. 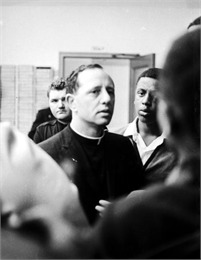 To avoid any more violence the mayor issued an order against further demonstrations, and Groppi, Phillips and other leaders were arrested when they gathered with supporters at a northside church. What you and your courageous associates are doing in Milwaukee will certainly serve as a kind of massive nonviolence that we need in this turbulent period. You are demonstrating that it is possible to be militant and powerful without destroying life or property. Please know that you have my support and my prayers. That fall and winter, the NAACP continued demonstrating, fair housing ordinances continued to be introduced and the City Council went on rejecting any law that would have prevented landlords from discriminating against African-Americans. After more than 200 nights of non-violent marching and eight months of fruitless lobbying, the NAACP called off its demonstrations on March 30, 1968, to re-think its strategy. Less than a week later, Martin Luther King was killed and the nation erupted in violence. In Milwaukee, the NAACP and Father Groppi organized a non-violent march through downtown to a rally on the north side. It was the largest demonstration in the city's history, with over 15,000 people participating. A week later, Congress passed and President Johnson signed the Civil Rights Act of 1968. Rather than violate a federal law, the Milwaukee Common Council finally passed a citywide open housing ordinance. See about Martin Luther King Jr. The story of the struggle for fair housing in Milwaukee as told in a new online collection from the University of Wisconsin-Milwaukee. View 'March on Milwaukee,' an article written by Margaret Rozga and published in the Summer 2007 issue of the "Wisconsin Magazine of History." The Society Archives contains one of the nation's richest collections on the career of Dr. King, including a copy of the files kept on him by the FBI, obtained by Pulitzer Prize-winning journalist Nick Kotz under the Freedom of Information Act. Kotz acquired the archive while researching his book about Lyndon Johnson, Martin Luther King Jr., and the civil rights movement entitled "Judgment Days." Kotz eventually donated the FBI archive to the Society along with other valuable research materials.